On the wall over my desk hangs an amusing trophy from the late, disgraced former President, Richard M. Nixon, whose lies about Watergate ultimately forced him from office. I framed Nixon’s letter–extolling secretive textile magnate Roger Milliken as one of America’s greatest businessmen–beside the May 1989 Forbes piece in which I also reported on the suitcases of cash Milliken gave to both Nixon presidential campaigns. On October 19, 2006, I encountered a liar rivaling Nixon–ironically then a “senior fellow” at Washington’s Nixon Center. Also then a consultant to ABC News and the U.S. Defense Department (DOD), Alexis Debat appeared at New York University Law School’s Center on Law and Security on an “expert” panel on the Muslim Brotherhood. Debat claimed he was writing “a book on the Muslim Brotherhood,” reportedly with an enormous, indirect DOD grant, through the Center for Strategic and Budgetary Assessments (CSBA) headed by former DOD analyst Andrew Krepinevich. Masquerading as a Sorbonne Ph.D. and former French Defense Ministry adviser, Debat simultaneously made the most preposterous claims. “Let’s stop hyperventilating about the Muslim Brotherhood,” he said, adding, “I hear the same things in a [British] church as I hear in a mosque”–despite frequent, recurrent incitements emanating from Islamic mosques, centers and schools, including myriad tapes, textbooks, and other media. As was obvious from his foolish remarks, Debat was no Muslim Brotherhood “expert.” Indeed, in September 2002 Agence France Presse had reported, the French Defense Ministry never employed Debat in any capacity–a fact further corroborated by terror expert Jean Charles Brisard, in a Sept. 26, 2007 email. Moreover, Debat never received a Sorbonne Ph.D. Responding to my Oct. 23, 2006 American Thinker report, Debat falsely complained of “misquotes and distortions,” which I easily refuted. NYU’s Center for Law and Security didn’t publish a recording–which would have been too embarrassing. Events quickly put the lie to Debat’s nonsense, as my colleague Patrick Poole noted in February 2007. Not until September 2007 did Debat’s employers take action, however, after his blatant serial fraud spilled onto the pages of Mother Jones, where national security reporter Laura Rozen exposed his frequent lies. Debat was officially forced to leave ABC, resign from the Nixon Center, and flee the U.S. According to Brisard, who remains in close contact with French intelligence, by late September 2007, Debat had taken refuge in the Dominican Republic to avoid a French civil suit and an imminent ABC lawsuit in the U.S. Debat has been totally debunked. One wonders why it took so long. More important, however, is why anyone still seriously considers Debat’s false notion of a “moderate” Muslim Brotherhood–the known parent of every Islamic terror group operating today. The Defense Department’s CSBA subcontractor fired Debat, reportedly before his ideas bled into official U.S. defense policy. 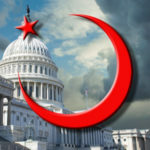 Yet, Debat’s equally dubious Nixon Center colleague, Robert Leiken, has successfully injected, among high-level U.S. policy makers, a lethal poison notion, that moderation and reform have taken hold within this radical Muslim organization. Mind, Leiken’s expertise and training lie in the politics of Latin America, as Poole reminded us in June 2007. There are no ideas remotely moderate or reformist within the Brotherhood, which continues unconditionally stating, in Arabic and English, its plan to Islamize the globe and impose shari’a (Islamic law) worldwide–largely through “flexibility”” (muruna in Arabic). That is, by deceiving as many people, for as long as possible, regarding the their true purpose. No wonder the Muslim Brothers seamlessly partnered with the Nazis during World War II, and with Nazi propagandists like pious Muslim convert Johannes (Omar Amin) von Leers long after. As reported innumerable times, particularly in the seven years since 9/11, both by Arab Muslims and Western media, the Muslim Brotherhood is not only large, it is one of the most malevolent forces operating worldwide today. In November 2001, following the Swiss raid on the home of MB financier Yousef Nada, the group has long operated as the central terror funding command, wiring funds for terror attacks through banks like the now-shuttered Al Taqwa, Saudi Arabia’s Dallah Al-Baraka Group, al-Rajhi Banking & Investment Corporation and Kuwait Finance House—as well as the Islamic Development Bank, a.k.a. the Intifada Bank for funding families of suicide bombers and Bank Meli of Iran. A series of fine articles by Youssef Ibrahim, Patrick Poole, Douglas Farah, Jonathan D. Halevi and many others have clearly demonstrated the folly of believing claims of a “reformist” Muslim Brotherhood, or “liberating” Muslim Brothers. We can only hope that the lies of outed fraud Alexis Debat, and other MB apologists like Robert Leiken, will prove less consequential than those of Nixon. To be certain, short of calling in some clean new plumbers, the Nixon Center might want to flush some Drano under the tap. This entry was posted in Articles, Business and Finance, Muslim Brotherhood, Shari'a finance and tagged Al-Baraka Group, Alexis Debat, Center of Law and Security, financial jihad, foolish, Islamic Development Bank, Islamic economic institutions, Islamic state, jihad, Kuwait Finance House, Latin America, liberation, Muslim Brotherhood, Muslim Brotherhood resistance, New York University Law School, Nixon Center, Richard M. Nixon, Robert Leiken, shari'a law, Yousef Nada, Yousef Qaradawi. Bookmark the permalink.